Thank you Dimple. This really is a fantastic salad! Welcome back! That salad looks delicious – and I WANT one of those julienne peelers. It really looks like a useful tool. Thank you… :) Definitely keep an eye out for the julienne peeler, it’s very cool! Welcome back, this looks delicious! The kitchen is my happy place, too! I love that peeler. I have been wanting the tool that makes zucchini into noodles, but this looks simpler. Your salad is such an interesting combination of ingredients and textures. I bet I would love it! Isn’t the kitchen the best place to be! A great way to get our minds off of work and create aroma’s and fabulous food! You would love this salad. It’s such clean food and the little kick of chipotle is nice. I’m just like you, I wanted that other peeler too. It would still be nice to own, however, this julienne peeler is really cool. Hope you get one! Hi Joanne. Hope you find an oxo peeler. You’ll love this with either cucumber or zucchini. It’s so flavorful and very attractive too. Thank you for stopping in! This is amazing thank you looks delicious! Welcome back! I hope your time away has been fun-filled and enjoyable. I love the sound and look of this dish and am always looking for new ways to use up all the zucchini we get weekly. Will definitely be giving this recipe a try! Also, my eyes got huge when I saw that vegetable peeler. I am adding it to my must buy list! Hi Ngan. Well I wish it was a fun filled vacation but actually I was very busy at work. Things are caught up and now I feel inspired to post again! You know, actually I think I prefer this salad with zucchini. 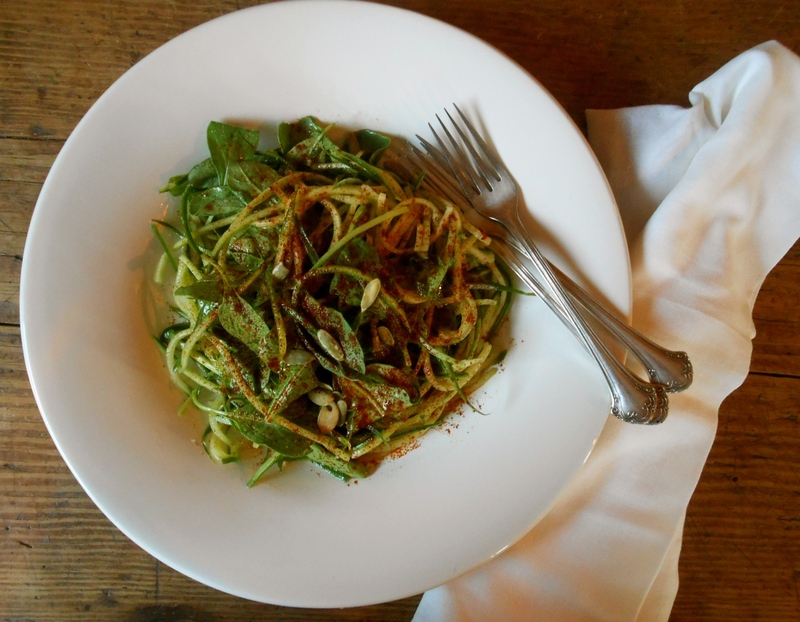 The texture of the julienned zucchini is so wonderful. Definitely buy the peeler. And then make this salad! :) It is really nice to see you here today. Thank you! Good to see you back! I took an extended break from blogging over the summer after getting caught up with other aspects of life, though similar to you, my kitchen time didn’t take much of a beating, it’s often what gets me through. Love the look of that julienne peeler, what a snazzy little gadget to have in your drawer! My gf gave me a mandolin a couple of months ago, and I have yet to get around to using it, despite the fact that the idea of doing so fills me with delight every time I think about it! Anyway, will most definitely be making this. Looking forward to seeing more of your posts, I love the way you eat! Karinna, your message just made my day! So thoughtful and kind. It’s a bit odd jumping back in after being removed for a month and I got a little bit nervous before pressing the publish button! I have wanted a mandolin for ages. It really is satisfying to create these perfect little julienne cuts. :) I can only imagine how fun using a mandolin would be. Especially with potatoes! Thank you again for your kind comment. By the way, I had to go out and buy the Oxo julienne peeler the other day! Made a cucumber salad yesterday to go with duck & miso aubergines. I intended to follow your recipe, but didn’t have everything on hand, so made a somewhat simpler version of it. 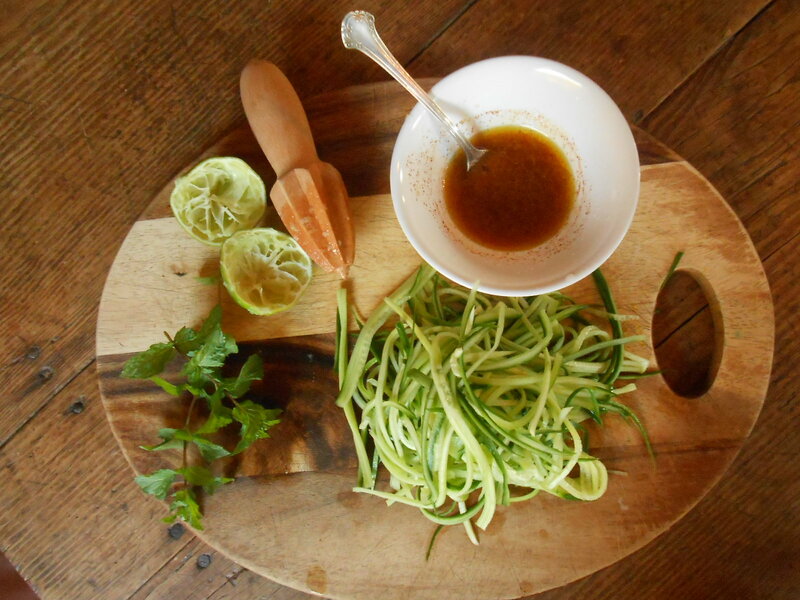 Was still good – I love how the julienne strips almost turn cucumber into a whole new thing! I’m so glad you picked on up! Isn’t it wonderful? I love to julienne zucchini too….and carrots. Very cool. Where you been, Seana? Great to have you back! That’s a refreshing salad that I thought at first was really made of noodles, like real noodles. Not that cucumber noodles are not real, of course :-). And I want that julienne peeler! Oh my gosh, I have a friend who has one of those cutters, and it’s high on my list of gadgets I’d like…It’s just sometimes I wonder how many things I need to cut stuff with!! Lol! You need lots of things to cut stuff with! :) Especially if you are going to make fancy cuts… Seriously, there is something very satisfying about using this tool. I love the perfectly even strands. Glad to see your comment this morning. I’ll be by for a visit today. OK, so now I feel affirmed! :) If only Amazon wasn’t so darned easy! And good to see you back with us, too! Welcome back, Seanna :) Really delicious salad. Hi Seana! You’ve been missed! :) I love how fresh and fragrant this salad both sounds and looks. With our weather warming up, this will be just the dish to accompany many a bbq (or perhaps to wrap up in rice paper, with our Vietnamese spring rolls?) 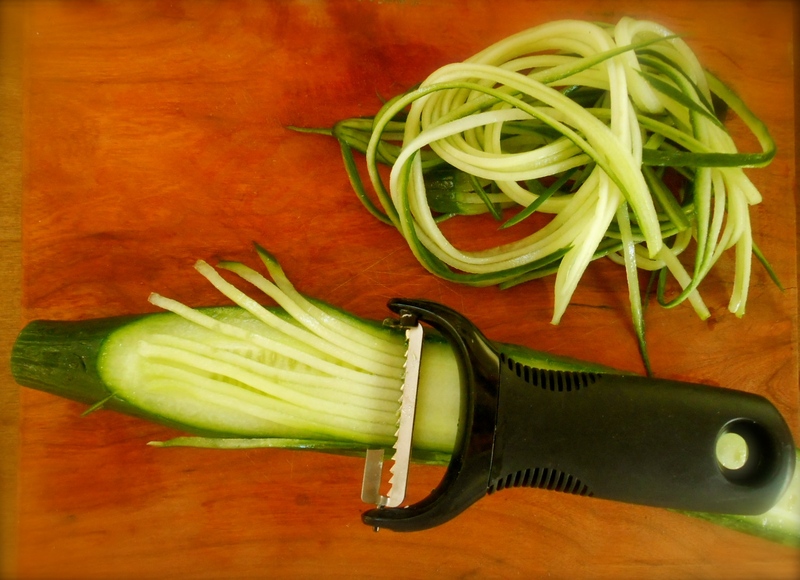 The julienne peeler is something I’ll be off to look for in the next few days… handy for so many veggies! Thanks for sharing and lovely to see you back! 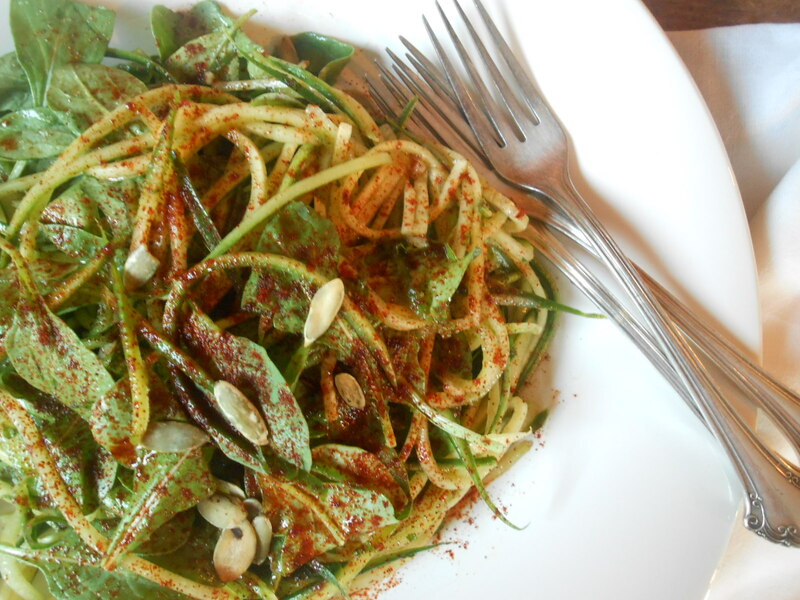 I always make a raw zucchini concoction, but your version with cucumber and this delicious dressing seems much better! I have seen the spiral slicer! It looks wonderful too. Honestly, I prefer zucchini in this salad over cucumber. I like the firmer texture and it is not so watery. However, the hydrating zucchini is really nice on a hot day. Zucchini in the fall/winter and cucumber in the summer. Solved. :) Thank you for stopping in and leaving me a nice comment Sally. Glad you are back Seana. Love the salad and the julienne peeler is appealing. I’ve had good luck with OXO products – my favourite spatula is made by them. I am only back because of your encouragement Lindy. ;) Your comment the other day gave me the little nudge I needed to swing into action. Thank you. And your last post was very inspiring. I thought about it for the rest of the day. I, too, love cooking marathon’s on a Saturday and your post was so beautifully written. I thrive in a calm and peaceful place and that is how our home is. I imagine your home to be the same. Wish we were neighbors. :) Ever listen to French Cafe on Pandora? Another great soundtrack for your cooking marathon’s. Seana – you’re sweet. I really wish we were neighbours. I’d drop of tins of baking while I walked my dog. And I’d share my herbs and flowers from the garden. And you could come sit in my kitchen with me leafing through cookbooks while I pour wine. your noodle is a very refreshing and healthy option!!! Happy you’re back with a post! The kitchen is my happy-place, too. Cooking can be therapeutic, I think! Recipe looks delish. Thanks for posting! Happy Early Birthday to you too! I cannot imagine being without a kitchen for a year… it’s hard enough using the small kitchen that I do have! What a fabulous recipe to mark your return to the Cottage Grove House, Seana! This salad looks delicious…I’ve got to find one of those julienne peelers! I love cucumber noodle salads. Somehow the shape changes the crunch and how the flavours blend. looking forward to tasting this one. It’s true, the julienne shapes are so wonderfully crunchy and texturally satisfying too. Love how this salad is so refreshing. I love cucumber salads too! Welcome back! Julienne peelers are the best. I originally bought mine to shred green papaya for a salad and use it all the time for all sorts of Fruit and vegetables. It’s bright orange and my children call it the happy peeler. Just two days ago we acquired another gadget – a bright green spiraliser, at first glance II thought you may have used one too for your cucumber noodles. I’m definitely making these with my brand new toy. Thank you. The not so original Mr Twisty. They spent an afternoon spiralising sweet potato into wide fettuccine ribbons which were twisted into coils and shallow fried until crisp. A bit like a fancy rosti. I wish we had one when they were younger – would have been a great way to get more vegetables in. I do think the happy peeler is more versatile though. :) Nice. Thank you Sonal. What a super simple, yet delicious, salad. I love the device you use to slice the cucumber. This is not only pretty, but I also really love all of the seasoning. Sensational! Yes and what a great way to get your mind off of the events of the day. I love to have dinner ready when my family shows up after their long day. It’s a perfect way to sit together and connect. I have been wanting a mandolin for years. I love the idea of perfectly cut vegetables, especially thinly sliced potatoes. Problem is I don’t like to have a bunch of gadgets and appliances in the kitchen! :) It’s so nice to hear from you Amanda. I’ll have to keep posting just to keep in touch! Hi Seana, love this dish, the dressing sounds amazing! The kitchen is my sanctuary as well, my happy place. At the first sight I thought you made some spaghetti…. can you believe it? your cucumber noodle look great Seana! Glad that you are back into action! Always great to hear from you! Add me to the long list of people who are glad you are back Seana!!! so much to respond to here– I agree that an hour in the kitchen, pulling a meal together offers a lot of contentment– and serving it up to your family… AND love that julian peeler!!! never heard of that thing before, but I’m off to track one down. And thanks for the recipe recommendations. Have made your lentil soup and the dal looks so inviting — All to say– so fun to have you back!! Thank you Rhonda! So glad to hear you have made the lentil soup. I love that soup. The cooking time is even shorter if you have access to Trader Joe’s “cooked’ lentils. You can find them in the refrigerated produce section. Have you tried them? Your comment is so nice. Thank you. :) …hope you order the julienne peeler. NO!! I’ve never seen the cooked lentils at Trader Joe’s– but I will look for them. it’s funny– one time I was at lunch with a table full of friends and we all started saying what we bought at Trader Joe’s and we all had very different lists!! So I found out all the things I should try. — like you cooked lentils! who knew?! Have I told you how much I love your recipes? They are so wonderful and inspiring. I want that kitchen tool! :) I love this salad, pinned it. good to see you again. Glad you’ve been enjoying yourself in the kitchen and glad you’re back to share it with us :-D This dish looks dreamy. Hi Liz. Good to see you too! :) Look forward to catching up with your blog. Glad you stopped in..
Cucumber noodles look tempting and tasty! Have the peeler! For sure will make the salad thanks! You are currently reading chili lime cucumber noodles at COTTAGE GROVE HOUSE.